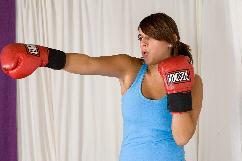 Your first private boxing lesson will typically go like this: We値l start out by chatting a bit about what your goals are, why you池e interested in boxing, and what (if any) other exercise you池e currently getting. Then we値l spend a few minutes discussing different types of boxing gloves. You値l try on several different pairs, and together we値l decide what works best for you. Next, we値l spend a few minutes discussing boxing posture and the positioning of your feet, knees, arms, and hands. 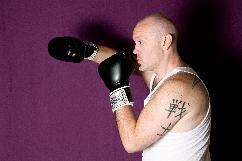 You値l learn two basic punches: a straight jab punch from the front, and a hook punch from the side. We値l start on the regular heavybag, then move to the springbag (a newer type of punching bag that痴 floor-mounted on a spring). Along the way, we値l discuss and explore breathing, speed, power, and proper body mechanics. Later in the lesson, you値l try a 15-second cardio bursting drill to get a taste of how boxing can be a great cardio workout. Finally, you値l review all of your newly-learned punches on handpads, while moving around on the floor. We do handpads in a revolutionary new way that痴 very different from what you may have seen in boxing movies or old-style gyms. During the entire lesson, always feel free to ask questions about anything. You should never feel like you池e being asked to do anything confusing, or anything that makes you nervous or uncomfortable in any way. After all, your first boxing lesson should be an enjoyable experience that leaves you wanting to come back for more! In the lessons that follow, you値l learn more types of punches and punching combinations. We値l start to explore foot movement around the bag (both circling and in-and-out). We値l also start to work on blocking and defensive moves, just in case a punch ever does come in your direction. Even if you never plan to actually spar with another boxer, it痴 still important to learn defensive blocking for self-defense purposes. You can expect to learn several new things in every lesson, as well as polish and perfect the skills that you started working on in previous lessons. 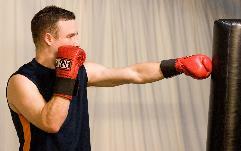 You値l be amazed at how quickly all of your new skills come together and have you starting to feel like a real boxer!